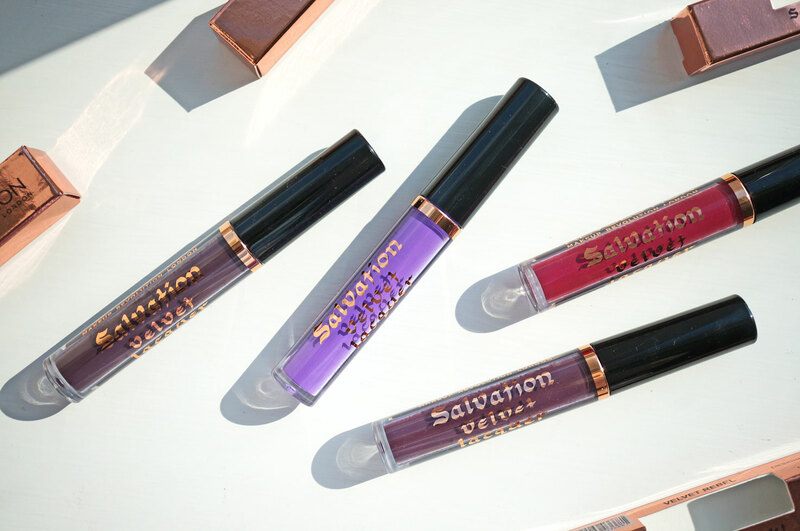 NEW Makeup Revolution Matte Lip Lacquers! 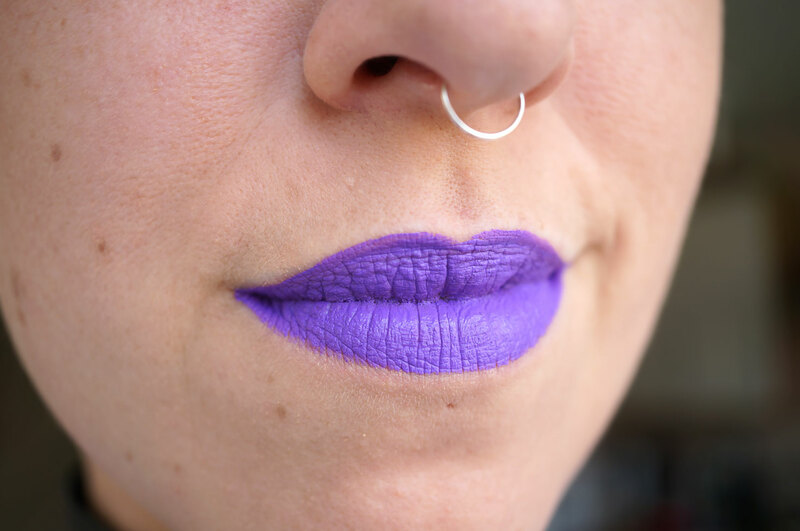 First up is Depravity, a bright clean blue toned purple, and it is stunning! This is easily my favourite shade out of the four and I can’t get enough of it! 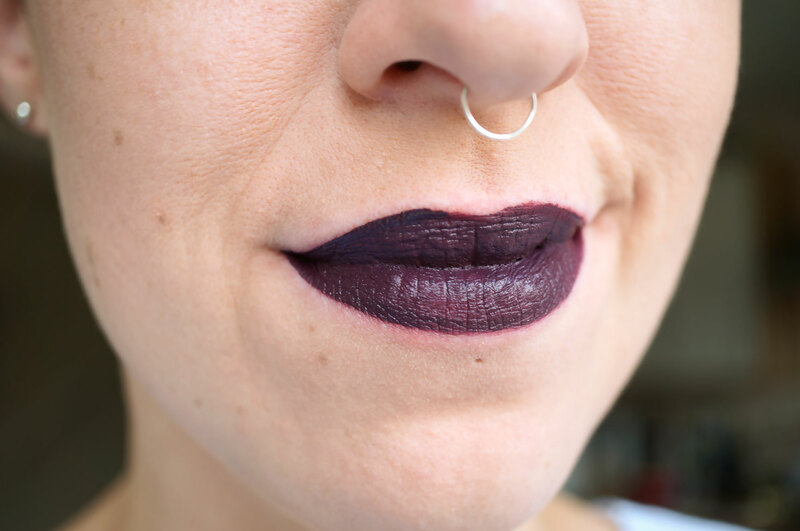 It’s everything I look for in a lip product, with 100% full opacity and a matte finish, what more does a girl need!? I also found this one applied the most evenly and was the easiest to manipulate compared to the rest. Next we have Rebel, an intense pinkish red. 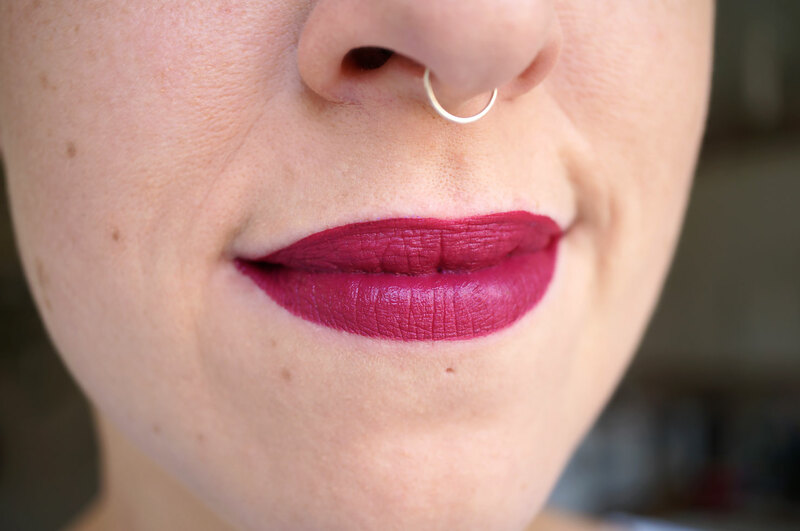 This is definitely the most easy to wear colour out of the four shades, this bright intense berry red is the perfect colour for the impending autumn and winter seasons too! Next is Vamp, I’ve just described this as deepest purple, it’s almost black but not quite. Now I should probably point out that this was actually the last colour I tested, as you can see the edges of my lips have gone a bit pink due to rubbing the previous products off. Once dried, these lacquers seriously DO NOT BUDGE, but I”ll tell you more about that in a bit. And lastly we have Black Heart, which is a super dark purple, so dark it really is almost black. You can see this is very similar to Vamp, there’s really not much in it al all except this is slightly darker. Now these lacquers are tricky things, the formula is obviously a liquid, which is easily to manipulate on the lips when wet, you can spread it around and build up the colour, but as soon as it dries it’s pretty much like glue! It doesn’t budge for love nor money! (think that’s a phrase my mum uses) I had to rub and rub and RUB to get this stuff off when I was testing it. And yes it was a bit of a pain, but at the end of the day we all want long lasting lipstick, don’t we? So now we have it! I’d recommend practicing with these before rushing to put them on before going out, like I said, this stuff won’t move once it’s dried. 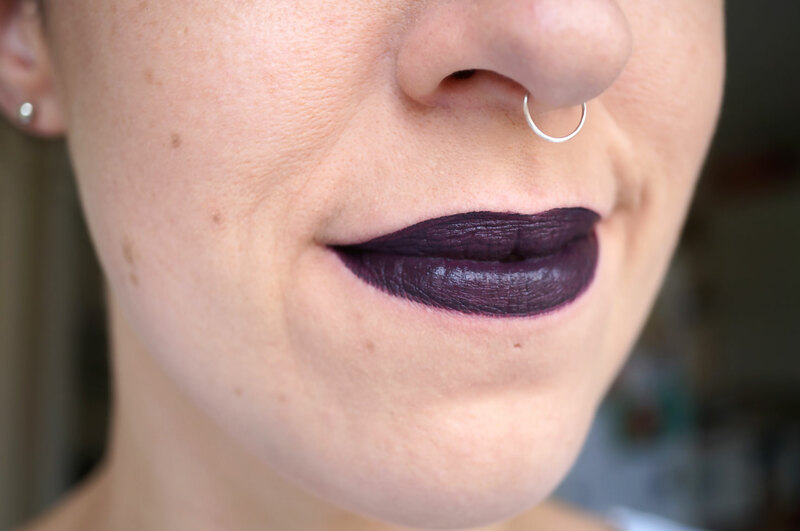 I found it pretty tricky to get a good clean line around the lips – because the lacquers are so super pigmented, any tiny hint of imperfection shows. My personal favourite, Depravity seemed to be the easiest to apply, though I’m not sure why as the formula appeared the same at the other shades. And the darker shades seemed to be a bit more difficult. All you need is a bit of practice and a steady hand! 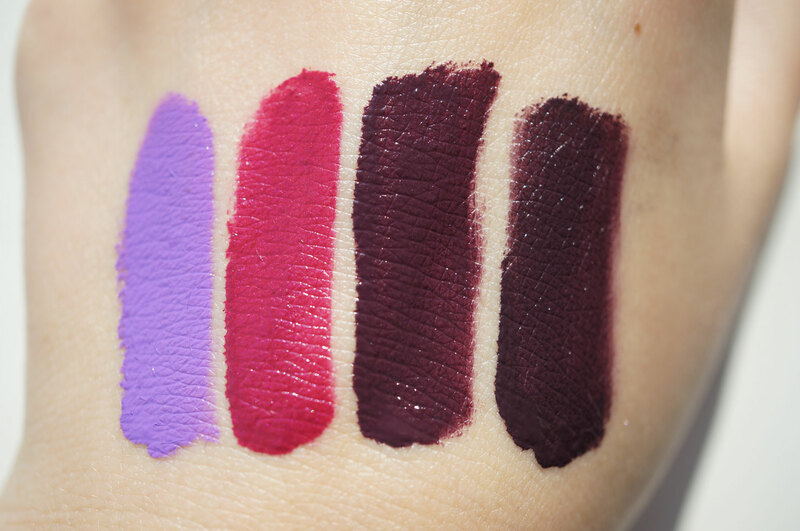 I’ve compared some of my hand swatches to the Lime Crime Clueless Witch Velvetines product images above. I do have a Lime Crime Velvetine, but it’s not one of the Clueless Witch collection, so I don’t really think it would be fair to compare. You can see the colours are pretty similar though! So there we have it, another fab bunch of products from Makeup Revolution, oh and did I mention these are only £3 each! What a bargain! I wonder what they’ll think of next!? I was just about to comment on your septum ring, you had me fooled there! These are lovely shades, I don’t think I’d be brave enough to wear them out of the house though haha. Oh you really suit a purple lip my love! And I love Rebel. Will be picking some of these up very soon! I really love Depraved, Rebel and Black Heart. I don’t really get why they’d make Vamp since its so similar to Black Heart? With that said I wish Makeup Revolution would make a true black … a girl can dream. Love your swatches by the way really helpful :)!